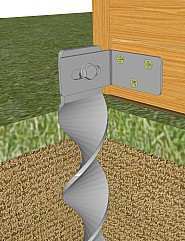 Our range of spiral ground anchors and brackets offers probably the best available system for securing outdoor products directly to the ground, no concrete or special tools are needed. 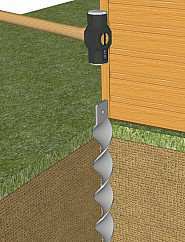 The anchors are re-usable, very straight forward and quick to install or remove. With 4 diameters, 4 styles, many length options and a large range of brackets, there is a solution for almost any situation. When the anchors are hammered, they automatically rotate, cutting a highly accurate thread in the ground - hence their high holding power. Fitting is quick and simple, standard Erdanker type illustrated below. 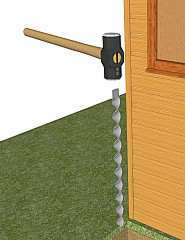 Hammer the anchor in, it will automatically rotate, cutting a neat thread in the ground. Hammer down to ground level then fit the bracket. The structure is secure. The bracket prevents rotation and unwinding. If removal is required, simply unbolt the bracket and unwind the anchor. 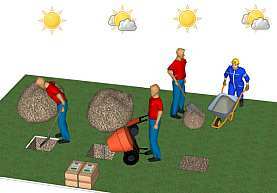 For long life, all anchors are hardened, enabling them to cope with conditions that most other anchors cannot handle; grass, hard compacted ground, ground with large stones, tarmac, buried bricks, chalk, clay etc. can generally be penetrated with ease. products are high quality and are made in factories in Germany or the UK. Products marked are dispatched the same day (or the next day if the order is received too late). Ordering is quick and simple, no registration needed, no passwords, no fuss. We take all the normal credit and debit cards. Open fronted shelters are dangerous if not fixed down. Our 50x770LP and 50x870LP Low Head Safety Anchors are specifically designed for animal shelters. 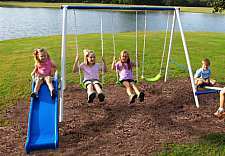 Outdoor play equipment can be secured with Standard Erdanker anchors, type JF anchors, or Low Head Safety anchors, depending on the situation.. The 25mm and 30mm anchors are widely used to secure park benches, kennels, street furniture, municipal equipment, picnic tables and much more. 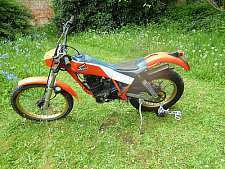 Ground anchors for securing motocycles, quads, garden machinery etc. 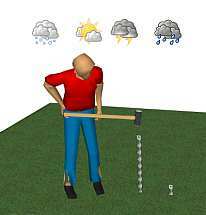 The Sherman anchors are hammered into the ground with a sledge hammer and can only be removed by unwinding them, which is not possible when chained to something. The 50x460LP Low head Safety anchors are made specifically for cross country horse jumps, and are used on many courses in many countries. In some countries, including the UK, it is mandatory to secure jumps. Our heavy duty, double sided lashing ring can be permanent or temporary and will penetrate hard or soft ground. The ring lies flat when not in use, to increase safety. Our JF range are designed to secure display products, temporary signs etc. The AT range is designed for general security and to chain equipment to the ground. Anchors and brackets for all types of swing: single, double, metal, wood, permanent or temporary. The ED16mm range has a 16mm hole for padlocks. The AT range have a 100mm diameter ring for chains or ropes. Both can be used for many types of security applications. 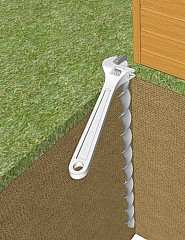 These anchors have a flange at the top and are used for both temporary and permanent fixing. 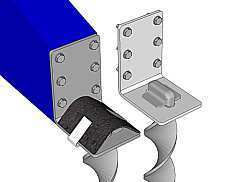 Should the structure ever start to lift, the anchor cannot unwind as rotation is prevented by the slot in the bracket.. Designed specifically for applications where animals could accidentally tread on them. For even greater safety, an optional rubber cover is available.